Five out of six residents agree a true frown of distain should come with a stiff penalty. However, this law needs clarification. 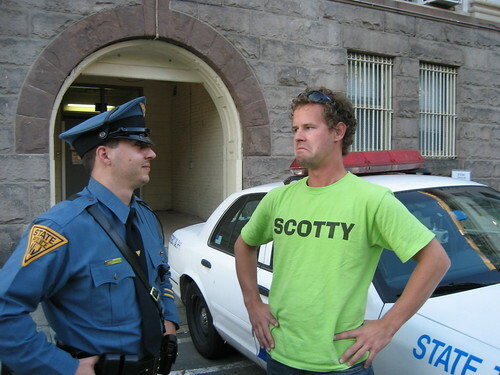 Below is a picture of Scotty frowning at a local police officer. This rebellious action landed Scotty a stiff penalty, but more importantly it put him on the soapbox to preach the true art form and precautionary measures of frowning. But what about the other frowns, the beautiful frowns, the little known frowns which imply other emotions or feelings. First is the frown of approval. This frown is closely related to the frown of a job well done and the frown of a hard days work. The differences come in the delivery. The frown of approval is delivered after a 4-6 second pondering session, followed by three slight nods of the head, a slight raise of the eyebrows combined with the frown. Many people choose to look from left to right at their colleagues to gain support and confidence in their decision to apply the frown of approval. The frown of a job well done, known as the frown of a hard days work west of the Mississippi is delivered promptly with more force and determination. After the task is completed the frowner usually takes a step back, inspects the finished product and delivers. The delivery is abrupt, with one firm head nod, combined with the frown. Note: Crossing of the arms, or leaning on a shovel is recommended, but not mandatory. The frown of authority came about during the days of prohibition and has been refined by law enforcement officers throughout the past century. The frown of authority is one of the few frowns that does not use any head nodding with the delivery. In fact, the delivery is quick and rarely seen. The frown of authority is usually waiting for you when coming across an authoritative figure. Often the subject has their back to the wall, with arms crossed, reflective sunglasses and a prominent moustache. The frown is static on the subject’s face and burns straight to ones soul. The frown’s hypnotic image stuns its victims for several seconds before the subject speaks or jumps into action. Be warned, this frown is not to be taken lightly. This is an open plea to the state on New Jersey to clarify the law. Think of this as a public service announcement and use it as a platform to demand action. Please clarify your laws so residents can continue their legal frowns in confidence. Talking about breaking laws, do you know it is illegal to hitchhike in the state of Washington? Good luck in the northwest! kinds of frowns...and now i do! i would like to meet you in person amd see your funny frowns! Where does that leave the frown of perplexion and the furled brow of deep study? Lol, wow, I didn't even know that was illegal in my state. That's even sillier than Indiana's law against frolicking in fountains.